NYX HAUL from JOY'S COSMETICS of eBay! Just a quick blog post before my super long flight! Of course Ebay is one of the answers! It is a fantastic place to get items that are not locally available. I love virtual window shopping on eBay, I can spend my whole day browsing this marketplace! And sure I had good bargains and great finds, I usually wind up buying accessories, craft items and washi tapes but I never bought any cosmetic and beauty products on eBay... Because when it comes to shopping for cosmetics, I am very careful. I've found quite a lot of counterfeited beauty products like eye shadows, lipsticks, glosses, brush sets and fragrances — all offered at prices that are too good to be true! A lot of scammers are out to make a quick buck, while there are few honest sellers out there too. 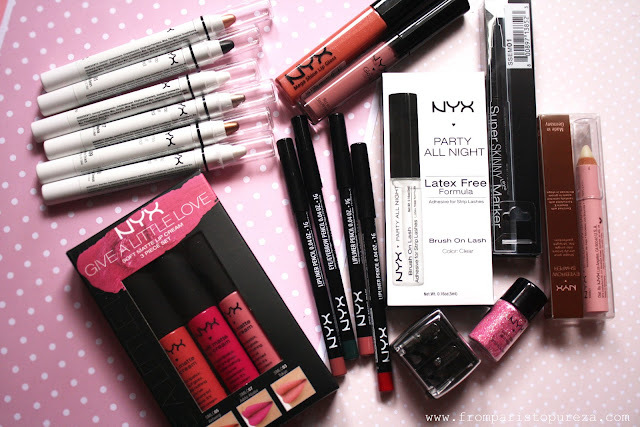 But since I am only looking for NYX products, the price is just a dirt cheap and not even a fraction of a high-end cosmetic brands like MAC (the most copied high end makeup brand) I feel quite confident getting some NYX products on eBay, of course after doing some research on NYX official website. That's it for now! See you, Manila!